I’m happy to announce that Cyn.in 3.0.5 is now available for download and installation. We’ve fixed over 40 stories in this update, and this includes some cool new features and some UI improvements as well. 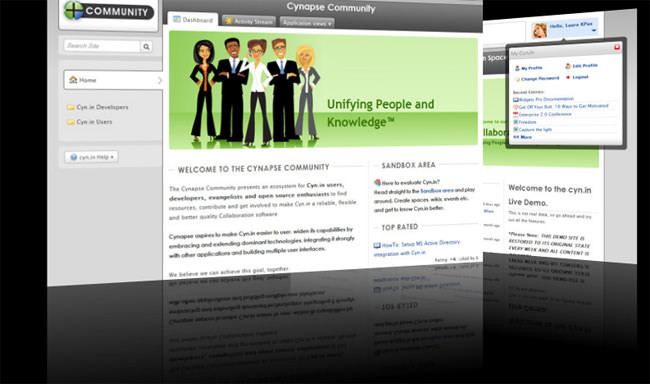 We’ve been listening to our customers, partners and the Cynapse community and one of the key points we’ve noted is that even though Cyn.in is conceptually designed to fit completely behind a logged-in scenario, a lot of people have mentioned that it would be nice if they could publish out content to anonymous users, anyway. If you have an open-ended community with Cyn.in for your organization, then this feature could be advantageous in increasing participation and overall awareness about your objectives. So keeping the design principles of Cyn.in within mind, we have worked on making this possible in the default workflows that ship with Cyn.in. You’ll now be able to set up your Cyn.in site such that you can selectively publish content to be visible to anonymous visitors (and search engine crawlers). Do note that we’ve kept the anonymous publishing flows a bit conservative, with the intent of having secure default settings. No content will automatically become published to anonymous, instead it must be initiated by user action. This action is intentionally restricted to the Site owner and Space editor roles. UI Changes: A new User menu is integrated into the top Adder bar. The toolbar now has all the key actions that you as a user of the system need to have. When being accessed anonymously, the entire top bar transforms to a single line message to login or register. The site logo now moved to the side bar, gets more prominence while users can focus on the top toolbar. Google Chrome Frame support: For those users who’d prefer to use Google Chrome within their Internet Explorer, they now can. This is another attempt to fight the horrors created by Internet Explorer 6! For die hard IE fans, who face speed issues with Cyn.in, this should help. Based on latest Plone: Cyn.in 3.0.5 is based on the latest stable release of Plone, 3.3.1 so all fixes of Plone are included. Due to a low-level problem between specifically the Webkit engine (that’s Google Chrome, Safari, iPhone, Android and so on) and JQuery UI the browser was not rendering Cyn.in properly. Fixed. The full list of fixed issues for 3.x series of Cyn.in can always be seen grouped by version, here .